1. A Second Grade Adventure set up a variety of stations where kids tried on different items that gave them an insight into how animals adapt, including some interesting gloves and side vision using toilet paper rolls! 2. Flower Garden has a fun lesson to demonstrate octopus adaptation, using slime and a funnel, to show how octopi can squeeze through super tiny cracks! 3. Ashleigh's Education Journey had kids use a variety of tools and instruments that represented different bird beaks. Kids tried picking up different sizes and textures of food. Check out her activity, as well as Sea World's! 4. Find out how blubber keeps arctic animals nice and warm with Steve Spangler's DIY blubber glove! 5. Teach animal adaptation with candy M&M's! Check out Science Buddies' M&M Survival Challenge! 6. 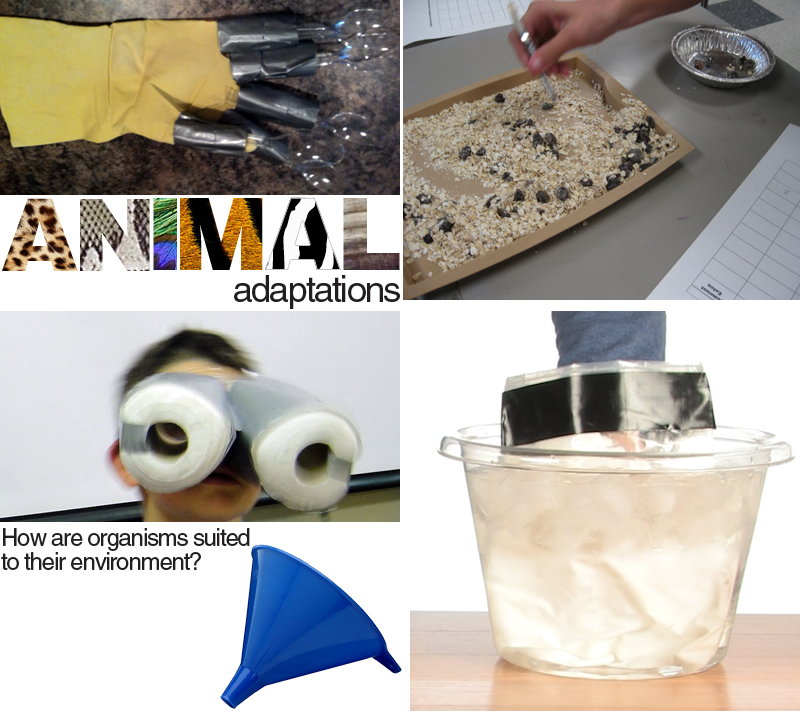 Visit HubPages for a couple more adaptation experiments to incorporate into your classroom! 7. Play an echolocation game, to teach kids how bats and dolphins locate each other and prey! Click here for instructions (scroll down to the bottom of the article). 8. Make giraffe spit and see how giraffes are able to eat from thorny trees without getting pricked! 9. Herbivores vs. Carnivores - Visit Science Matters to see how dinosaurs chomped on leaves!